Category: Antivirus & Security. Tag: Max Secure Software. Max Secure Spyware Detector is a complete solution for individuals, professionals and home users. The software is specially designed to scan, detect, delete and recover spywares with an option of quick and full scan. 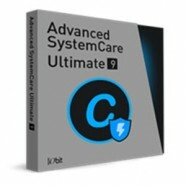 This software is also powered by some advanced features that are similar to our corporate edition like, Block Active X, Block Cookies, Block BHOs, Registry back up, Live Monitoring for IE home page hijacking, system and win ini file change monitor, monitor registry changes, tracking cookies monitoring and Process monitoring. The software has a complete database of the most commonly and largely found spywares, which are detected and can be deleted immediately. Our live update module will enable our users to update their spyware database frequently. Growing spyware attacks and constantly changing spyware technology are placing personal information, privacy, and even your identity at risk. We at Max Secure Software provide you the most robust solution against Spywares. We have developed the world class Anti Spyware, Max Secure Spyware Detector which is a complete solution for individuals, professionals and home users. The software is specially designed to scan, detect, delete and recover spywares with an option of quick and full scan. Spyware Detector scans your entire system using a constantly updated database of thousands of known spyware threats. You can schedule regular scans or perform one manually to find and remove spyware, adwares, malwares, pests, and spybots from your PC. If any files or traces of spyware match the threat definitions database, Spyware Detector immediately quarantines them. We have a dedicated database team which uses state-of-the-art spyware research methods and identifies new spyware threats before they are widely distributed. Max Spyware Detector ensures that you have the most powerful and up-to-date protection against new emerging spyware threats. Max Spyware Detector has advanced blocking features which block ActiveX, Browser Header Objects, Tracking Cookies; you can also block the bad websites or the websites you feel are not worth browsing. This feature blocks the new spyware installations, ensuring that you have peace of mind you desire. 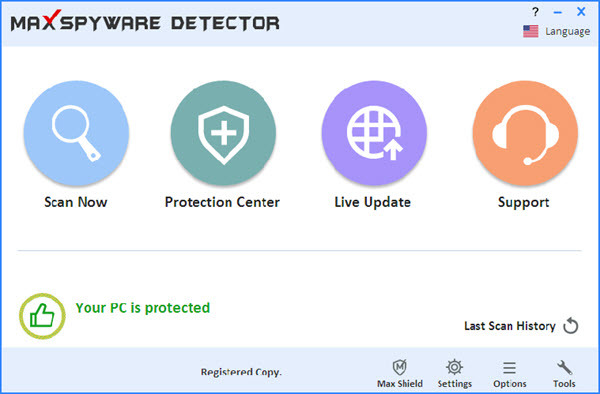 Max Spyware Detector also protects your privacy and provides you security by actively protecting you against the Malicious processes, Homepage hijackers and Tracking Cookies. Thus giving you the peace of mind while you are browsing. 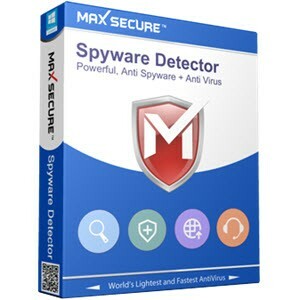 Max Spyware Detector detects and deletes the toughest spyware programs in just one scan. Also it provides advanced and comprehensive cleaning technology for the special spyware which are the nastiest next-generation spyware threats. 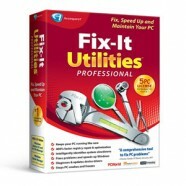 As a customer of Max Spyware Detector, you are assured that you are always backed up with our technical support force. Our technical expert and friendly support team is always there to answer any questions you have, absolutely FREE!